Two-dimensional materials could underpin a novel family of flexible, low-power electronic devices, but their success depends on ensuring the layers are chemically stable. A*STAR researchers now show that one 2-D material, phosphorene, can be stabilized with the right choice of substrate and an electric field. Graphene, a single layer of carbon atoms, deserves its reputation as a supermaterial; it's strong, hard, light, has excellent electronic and thermal properties. It is the archetypal 2-D material. More recently scientists have created single layers of other materials—tin, germanium, boron, silicon and phosphorus—with their own signature properties. For example, while graphene is a semi-metal without a band gap, phosphorene is a semiconductor like silicon, which makes it useful for electronic devices. However, phosphorene has a notorious drawback: the material oxidizes in air and its quality is rapidly degraded. In search of a viable approach to overcome this, Junfeng Gao and colleagues from the A*STAR Institute of High Performance Computing use first-principles calculations to demonstrate that placing phosphorene on a molybdenum diselenide substrate and applying a vertical electric field can drastically increase its resistance to oxidation. 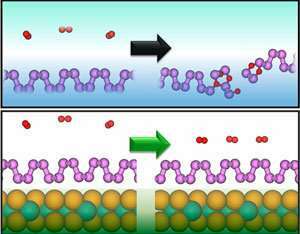 "The interaction and charge transfer between substrate and phosphorene can be tuned by an external electric field, causing a change in surface activity and suppressing the oxidation of phosphorene," explains Gao. Their study shows that the dominant process involved in the degradation of phosphorene in air is the absorption of oxygen. The fast oxidation of freestanding phosphorene in ambient conditions is due to a low energy barrier for oxygen absorption of about 0.57 electronvolts: oxidation can occur in less than a minute. When this analysis is repeated with phosphorene overlying molybdenum diselenide, the energy barrier is much higher. As well, the model shows that the presence of the molybdenum diselenide substrate enables more effective tuning of the properties of the phosphorene with an electric field. This increases the oxidation energy barrier even further. Under a suitable vertical electric field, the barrier can increase to 0.91 electronvolts. This lifetime of the phosphorene against oxidation can be 105 times greater than that without treatment. Gao's approach to achieve air-stable phosphorene may greatly promote its use in practical devices. "We will explore more substrates for their ability to stabilize phosphorene," says Gao. "In particular, we want to find out if such a substrate is suitable for epitaxial growth of phosphorene."